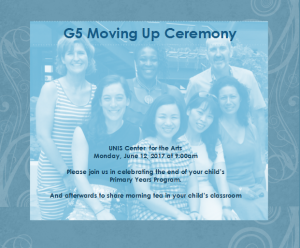 We’re so proud of Grade 5 and all they’ve accomplished this year. It was lovely to celebrate their progress with you on Monday this past week. Please find the Graduation Professional Photos in this link. You may download the photos you like as you wish. The Grade 5 teachers wish you a wonderful holiday. The days leading up to the end of the school year are busy and full. 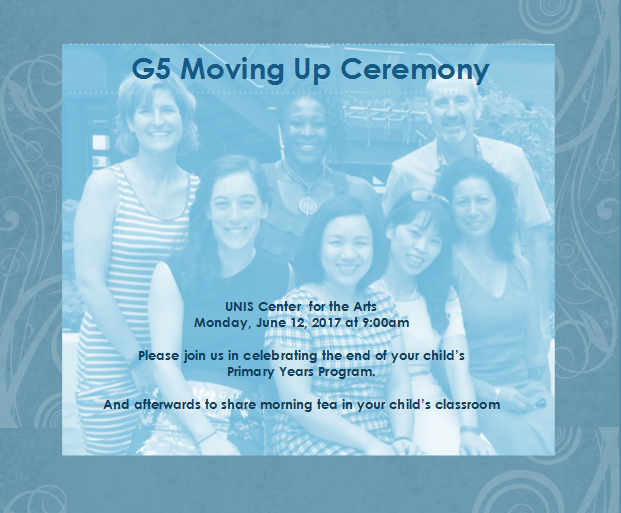 The ceremony will be followed by a cupcake celebration in your child’s homeroom. No shorts for either male or female. Girls should remember to wear a pair of tights/leggings under short dresses or skirts; no bare stomachs. Small heel is acceptable, but no high-heeled shoes. 11.00 Early Lunch – Students need to bring lunch from home for this day only as we’ll be leaving early for our grade-wide celebration. Please take time to read the Summer Reading Program in preparation for Grade 6. Your child is expected to read two English books over the holiday. Complete details are in the document. We look forward to seeing you all on Monday morning at 9:00 am.